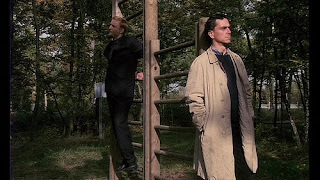 We're going all the way back to the very first European Film Awards (EFA) with this one - in 1988, George Sluizer's film of Tim Krabbé's novel The Golden Egg took the cinema world by storm - rarely, if ever, has a film captured existential horror like Spoorloos (The Vanishing) (1988). As I indicated in my earlier post concerning Michael Haneke's Funny Games (1997, 2007), Sluizer made the unfortunate choice of remaking his film Stateside in 1993 - apart from an intriguing performance from Jeff Bridges, there's little to recommend the later version. But the first film is something else again - we join Rex (Gene Bervoets) and Saskia (Johanna ter Steege), a young couple in love, who are on vacation. Following a row over nothing, they make up, stop at a busy service station, and Saskia disappears. Three years and, despite his extensive efforts to find out what happened to his lost love, Rex is nowhere nearer finding an answer - until, that is, he begins receiving letters from a man, Raymond Lemorne (Bernard-Pierre Donnadieu), claiming to know exactly where Saskia is. Fearing for his sanity, Rex starts to play Lemorne's games...the horror, the horror. Central to the conceit of the film and original novel is the intriguing premise of just how far anyone would be prepared to go to find out the truth - and the terrible price that must sometimes be paid for doing so. Bervoet's performance details very well the frustration, despair and obsession of wanting to know the answer, but it is Donnadieu's utterly impassive, amoral Lemorne that truly chills the blood. Ter Steege won the first EFA Best Supporting Actress Award for her turn as the charming, whimsical Saskia - a delightful characterization that makes the revalation, when it comes, of what happened to her all the more harrowing. 107 mins. In Dutch, French and English.